My project right now really seems to be my cat. No, my project is keeping my patience with my cat. Bob. Bob Cat. Actually, his full name is Bob The Barfing Cat. Yeah, he’s a barfer. That’s not the problem, though…..I’m used to that. Bob is an outside cat and Bob got bit. I didn’t actually see what happened to him, but it sure looked like a big tooth got him. And that tooth was probably attached to a dog. Bob does go exploring….. 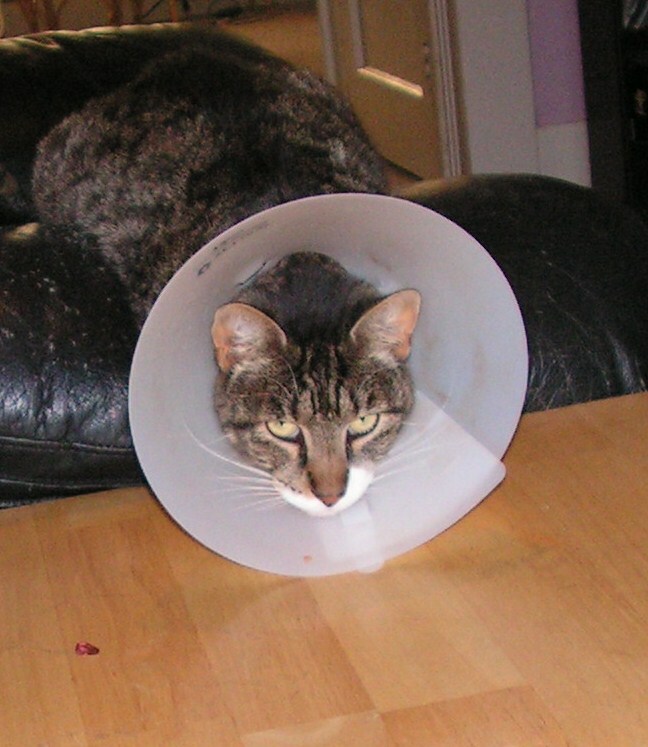 So, I took him to the vet and they cleaned him up and stitched him up and then…..
….they put a big collar around his neck. Bob is not a happy cat. Bob wants out. I want Bob out. Bob can’t go out. Bob would be pretty darned defenseless if he went out. I had no idea how defenseless he would be when they told me as I was taking him home from the vet to be sure to keep him in the house – “DO NOT let him out”, they said. I thought maybe they were over-stating it a bit but, no they weren’t. He loses his balance – it seems to really affect his equilibrium – he just plops over sometimes……..I try not to laugh too hard (I’m sorry, but it does look pretty funny). He has no peripheral vision, obviously – can’t see anything coming from the side so he gets startled easily….and plops over. So, he’s stuck in the house for two weeks….barfing. And meowing. And staring out the window. Keeping me awake at night trying to find a way to open the windows – trying to get out. I’ve tried playing with him. I have this little foam ball at the end of a string that I use for playing with him and he just ends up getting frustrated because he can’t see it half the time and can’t see his own arm….er…..leg…..uh…..paw reaching for it, so he just quits. Poor guy. He’s going nuts. He’s driving me nuts. It’s been a few days since the stitches went in and 8 days, 22 1/2 hours until I can take him back to the vet to have the stitches taken out…..but who’s counting?